This week we touch on the growth up front, an interesting self-reported stat and a freshman drawing his fair share of comparisons to recent Trojan standouts. It was the sweetest sound of spring, more saccharine than bird songs and Opening Day baseball and children on spring break all rolled together: Clay Helton heaping praise on the offensive line. I joke, of course, but after last fall’s chaos up front, there may be no more welcome development this spring than the offensive line gelling alongside Graham Harrell’s Air Raid offense. And Helton wasn’t shy about believing they have, either, after Saturday’s practice. 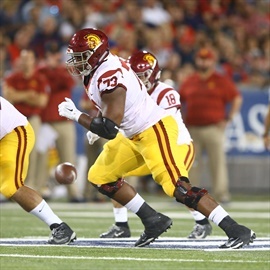 Austin Jackson is a key player for USC on the OL in the 2019 season. Unsurprisingly, that growth has come on the backs of the five-man class of 2017, the team’s last great haul. With apologies to the Jay Tufele-Marlon Tuipolotu-Brandon Pili-Jacob Lichenstein quartet on defense, no one position class on the roster is more essential to the Trojans’ fortunes this year than that of Austin Jackson, Alijah Vera-Tucker, Brett Neilon, Andrew Vorhees and Jalen McKenzie – who, left to right, could comprise this year’s starting line. Helton singled out Jackson and McKenzie as the unit’s leaders, a statement that is probably says more about McKenzie – who has to fend off couple of experienced bodies in Clayton Bradley and Bernard Schirmer and, eventually, perhaps a grad transfer like Drew Richmond – than Jackson, who is locked in at left tackle and doubles as the unit’s most physically gifted player. But no matter what form the line ultimately takes, expect at least four players of this group to start against Fresno State. So much is riding on them, between their overall skill and their backups being raw or growth-limited or both, that it’s fair to posit that if this group doesn’t touch greatness, it could be a while before we watch another Trojan offensive line that does. USC finished 121st in penalty yards last season. Two years ago, it was 117th. In 2016, the Trojans were 115th. The year before that, 114th. Suffice it to say, penalties have been part of USC’s DNA in the Clay Helton era and among the most urgent areas to recode to help spur a turnaround in 2019. So more than a few eyebrows were raised when Helton reported to the media Saturday that, over the previous two days, the Trojans record just one penalty – a false start – in 200 snaps. The obvious caveat applies that this borderline impossible to improve from the outside, especially from the media’s current vantage point. "I'm not seeing us out of position. I think we're doing the proper things to not only win our matchups [but] to not create penalties. But, taken at face value, it’s an extremely positive barometer for how things have progressed in a critical area. Helton cited two causes for that growth. First, Harrell’s offense, which is designed to minimize overthinking and to declutter verbiage. That part was obvious from the moment Harrell took the OC job. Second, though, is good old-fashioned execution. "When I'm watching the tape, I'm not seeing a bunch of holding calls," Helton said. "I'm not seeing us out of position. I think we're doing the proper things to not only win our matchups [but] to not create penalties. Helton also pointed to increased accountability for mistakes, such as subbing out the lineman who committed that false start penalty. All of this, frankly, is USC doing exactly what it should be. If you’re a pessimist, you can point out that these are the sort of basics inherent to most successful teams – the basics that should have been here all along. But the fact remains that they may be getting here now, finally, in an offseason in which comprehensive growth has been demanded and perhaps will be realized. The Trojans can’t win without doing little things that across the board. Here’s a sign that they might be getting them. By now, you likely know that Harrell’s interpretation of the Air Raid is vastly more balanced than, say, Mike Leach’s. 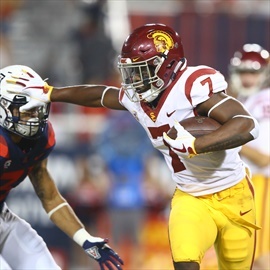 USC can and should be expected to run the ball often with the talent at its disposal. What you might not know is that no such balance exists in the division of labor within the actual backfield. The Mean Green’s leading rusher last season, Deandre Torrey, had 101 more carries than second-placed Loren Easly, the entrenched starter heading into the year prior to suffering a season-ending injury. Easly, for his part, nearly doubled the rushing yardage of his understudy, Nick Smith, in 2017. 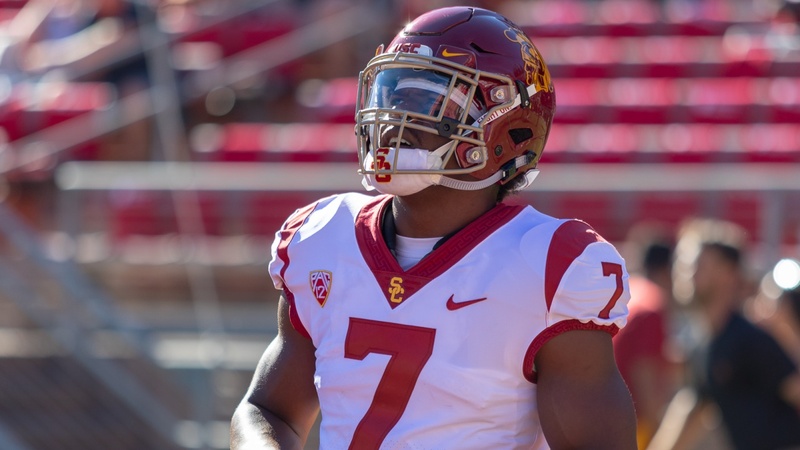 Stephen Carr could be the one to carry USC’s load out of the backfield in 2019. It was much the same for new running backs coach Mike Jinks at Texas Tech, where, after splitting the load fairly evenly between his top two backs in 2013, he allowed Deandre Washington to tote the rock 140 more times than second-placed Justin Stockton in 2014 and rush for more than 1,000 yards than second-placed Patrick Mahomes in 2015. The takeaway? Harrell and Jinks are likely searching for a feature back and they won’t be shy about the workload once they find him. But, who? Through three weeks, all three of incumbents have made their case. Stephen Carr remains the most physically gifted, with the widest range of talents. Markeese Stepp has notched the most highlight plays, headlined by a punishing practice-ending run to cap off the final practice of Week 2. Vavae Malepeai, meanwhile, has been perhaps the most consistent in drills and profiles something of a blend between Carr’s flash and Stepp’s bash. Don’t expect this to be resolved until well into fall camp, when true freshman Kenon Christon will also be in the mix and can distinguish himself with the straight-line speed none of the returnees possess in their toolbelts. If past precedent holds true, the opportunity gap between first- and second-string could be higher than any other spot on the depth chart, giving this battle some of the highest stakes on the roster.